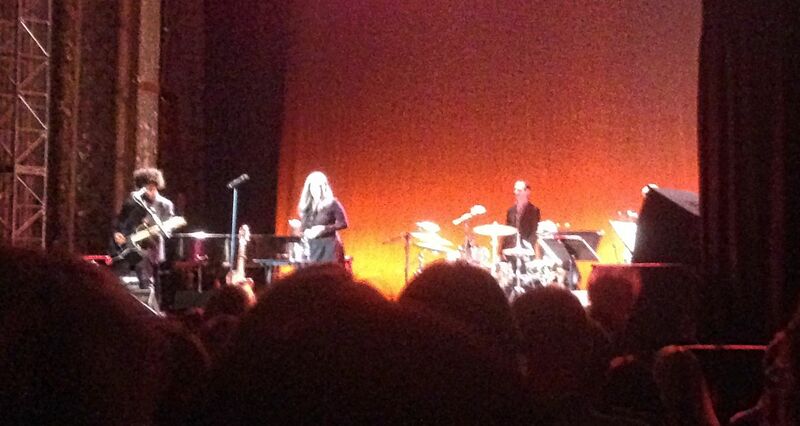 That was Natalie Merchant’s July 11, 2014, concert at the Keswick Theatre in Glenside, Pa.
That’s not to say a known song was needed, just something that laid out the night’s itinerary in more dramatic fashion – something that grabs you by the proverbial lapels. First Aid Kit, for example, opened with “Shattered and Hollow,” a dirge-like number in which the narrator declares she’d “rather be broken than empty” and “moving than static.” And Bruce Springsteen & the E Street Band kicked off their 2012 shows with the anthemic “We Take Care of Our Own,” which set the stage for all that followed. The hypnotic “Giving Up Everything,” also from the new album, would have worked better in the lead-off spot, I think. It’s sparse yet powerful – a lead-off home run, to return to the baseball metaphor. It’s both a statement of purpose and, in its way, anthemic. In any event, by “maggie and milly and molly and may” – Natalie’s mesmerizing take on the e.e. cummings poem (from her 2010 Leave Your Sleep project) – it didn’t much matter. I could see some folks still scratching their heads, confused by their lack of recognition of the song, but, by and large, the audience’s restlessness was fading into rapt attention. Highlights abounded, including the usual suspects of “Life Is Sweet,” “Break My Heart,” “Wonder,” “These Are Days,” “Carnival” and “Kind & Generous,” which closed the show. Also: the sultry ode to femme fatales, “She-Devil” (from her 2005 Retrospective set); “River,” her heartfelt song about River Phoenix; and two off-the-cuff covers, “Always on My Mind” and “Super Trouper.” (Yes, Willie and Abba in the same set!) And “It’s a Coming” and “Ladybird” both rocked much harder than they do on album – “Ladybird,” especially. Guitarist Gabriel Gordon had a field day on that. The only downside: the overzealous security personnel, who raced helter-skelter around the theater stopping folks from taking pictures and/or filming songs. It was far more of a nuisance than what, I presume, they were trying to stop – someone holding their phone up to snap a shot or record a video isn’t much of a bother, at least to me, but when a security guy races into a row to tap said someone on the shoulder, as they did more than once, it’s beyond distracting. At one point, during the encores – everyone’s on their feet, dancing (or, in my case, bopping about), a security guy slapped at a woman’s phone while she snapped a picture.